Located close to many UC San Diego students, Convoy Street in Kearny Mesa offers an abundant number of Asian cuisine options. From breakfast, lunch, dinner, or dessert, Convoy will have something for you. Though there are many restaurants available, the following are a few of my personal favorites places in no particular order. Imagine a steaming hot bowl of flavorful ramen. This is what RakiRaki is best known to serve — authentic ramen from Japan delivered right in front of you. Its ramen noodles are chewy and its broth is made so you can taste the amount of time spent creating the bowl of near perfection. I also highly recommend its Chicken Karaage (fried chicken) as an appetizer to share with your friends. Phuong Trang is many UCSD students’ go-to location as it provides fast service with affordable prices and good quality pho. This restaurant has been my all-time favorite because of its casual atmosphere that makes it great to catch up with friends. I just recently discovered this gem. Located in the same plaza as RakiRaki and Cauldron Ice Cream, Tofu House serves a variety of Korean dishes. From sizzling stone bowls to warm tofu soup, this restaurant is ideal for a cold and rainy day. It also offers a basket of eggs for your dishes and complimentary drinks by the front door for patrons who are waiting. However, the seating is rather tight and not ideal for a big group during busy times. Friend’s House is another Korean tofu house. However, the atmosphere is more intimate with spaced-out seating, friendly service, and unique decor. It offers more side dishes compared to Tofu House and refills are quick. My personal favorite is its bibimbap. Tajima has several locations throughout San Diego and even one in Tijuana! It serves a variety of Japanese dishes like ramen, sushi, and poke bowls. Its happy hour offers great deals for lunch or an early dinner after your classes. As a student who studied in Thailand a few months ago, I would say Koon Thai arguably closely resembles authentic Thai cuisine. In fact, I personally prefer Koon Thai’s Thai tea over the Thai teas I tried in Thailand. I recommend trying its green curry and pad kee mao (drunken noodles). If you are craving Korean fried chicken, this restaurant offers tender, juicy, and delicious chicken. It has friendly service and a Spicy Wing Challenge where the contestant tries to finish the Carolina Reaper-flavored wings under five minutes for multiple prizes. I have and will not attempt it — however, I truly recommend its boneless chicken in Seoul Spicy and Thai Chilli sauces along with its beer battered fries. Black Magic. This is Freeze’s famous charcoal butterscotch-flavored liquid nitrogen ice cream. Initially, I was afraid to try this unusual flavor, but despite it leaving black-stained crevices on my teeth, it is extremely creamy and flavorful. Freeze allows you to select the waffle cone color of your choice to customize the dessert and make it picture perfect. Did I also mention that this shop has unique decoration and decent lighting for that perfect Instagram photo? SomiSomi is right around the corner from RakiRaki and serves a Korean-inspired dessert called Ah-Boong. With a small selection of flavors of soft serve ice cream and filling to choose from, it is served on a fish-shaped cone. This restaurant is a great way to get your sweet cravings fixed after dinner and is great to share with friends. 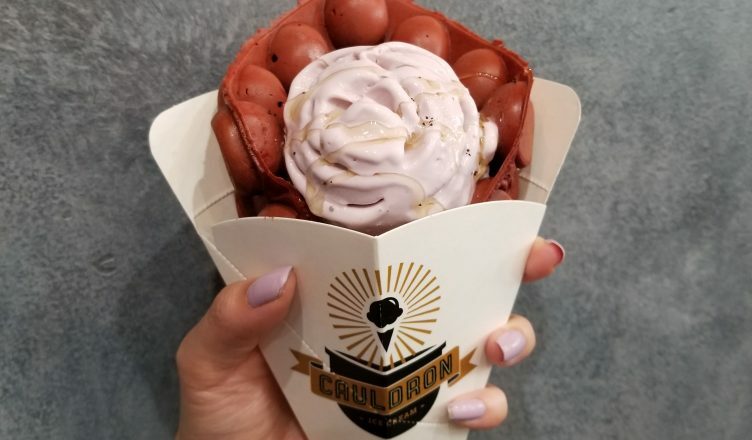 Sandwiched between RakiRaki and Tofu House, Cauldron’s Convoy location opened last summer. Serving liquid nitrogen ice cream in a puffle cone, its ice cream is creamy and rich in flavor. It takes the time to create a rose-shaped ice cream scoop, making it picture perfect. Like Freeze, Cauldron aims to create an Instagram-inviting atmosphere; however, I personally find the lighting too dim. These are just a few of my personal favorites that I find myself going back to constantly; there are numerous restaurants and shops I have yet to list and try in this article.